Shylaja Vijayan, president, National Ayyappa Devotees Association, has filed a review petition in the Supreme Court through her advocate Mathew Nedumpara, seeking to reinstate the ban on entry of women of menstruating age into the Sabarimala temple. As women in south Kerala protest against the Supreme Court decision, Vijayan tells Rediff.com's Syed Firdaus Ashraf why she disagrees with the court ruling. I have filed a review petition urging the Supreme Court not to allow women (of all age groups) inside the Sabarimala temple because the voice of devotees is not being heard. The original petitioners were not devotees of Lord Ayyappa and, therefore, I felt that I must intervene. The first petition was filed by the Young Indian Lawyers Association, quoting an article by journalist Barkha Dutt, on why they want women of all age groups to enter Sabarimala. Barkha Dutt wrote in her article that women of all age groups are not allowed in the temple. None of the petitioners (who won the case) was an Ayyappa devotee. They were from Punjab. Article 32 of the Constitution says any citizen can approach the Supreme Court against the violation of their Fundamental Rights. The women who went to the Supreme Court never said they were devotees of Lord Ayyappa. So being a devotee, my Fundamental Right is being snatched away because of these women. This is what Justice Indu Malhotra highlighted in her dissenting verdict. But because of the Supreme Court judgment, I am being denied my freedom of religion. Since childhood, I have been a devotee of Lord Ayyappa. Next year I will turn 50 and then I will enter the Sabarimala temple, according to traditional rules. You may call it stupid, but I believe Lord Ayyappa wants to meet people like him, or those who have taken penance. I have been to all other Ayyappa temples, but only in Sabarimala temple are women of all age groups not allowed and I don't see any problem with that. Lord Ayyappa is a brahmachari (celibate). He lives in seclusion and does not want women (of all age groups) to visit him. This is the belief of millions of devotees. My parents are from Kottayam, which is thickly populated by Ayyappa devotees. In our day-to-day life, the values and rituals of the temple are placed very highly. This is ingrained in our mind from childhood. We have been brought up with these values that women cannot enter the Sabarimala temple. One fine day, you cannot get up and say we have to delete such thoughts from our mind. If this verdict prevails, what are we going to teach our future generation? What values will we teach our children? Our opponents say the Constitution teaches all citizens to have a scientific approach life. I want to ask them: Why do we have voting rights only for adults? Is there any logic behind it? No. Now millions of devotees have come across in my support and I am happy about it. Vijayan evaded a reply when asked if the Supreme Court abolishing triple talaq was not a denial of the right to religion. "When you go to a doctor he gives you medicine and tells you to take it three times a day. You cannot gulp it all in one go. If you do you will die," Vijayan said without elaborating. Asked if societies evolve with time or not, she said, "There are much more important issues to be addressed in Indian society." "There are lakhs of women who are homeless, lakhs of them suffer from sexual violence, lakhs of them also suffer from domestic violence. What is society doing about that? Nothing." 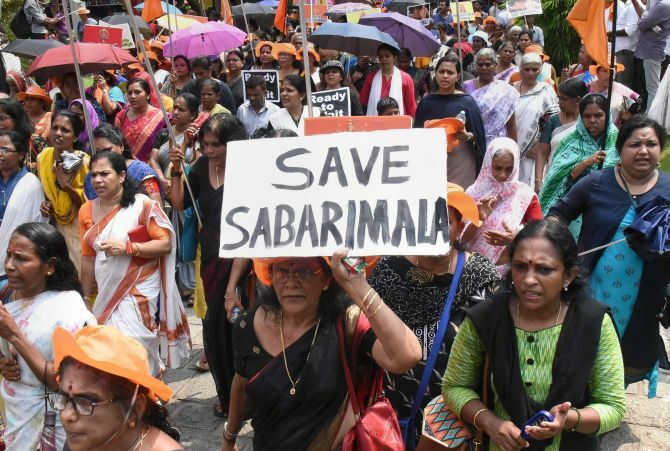 "The women who want to enter the Sabarimala temple must find out what the state of women in India is and how they live rather than going after this case." "Women entering Sabarimala," she said, "will disturb the mental peace of devotees."